In winter of 2016, Polymath LLC began a custom implementation of the LivePlan Method for Strategic Advising. Polymath was looking for a solution for full-scale advisory services that would position them to profitably and confidently engage with their clients in business planning. 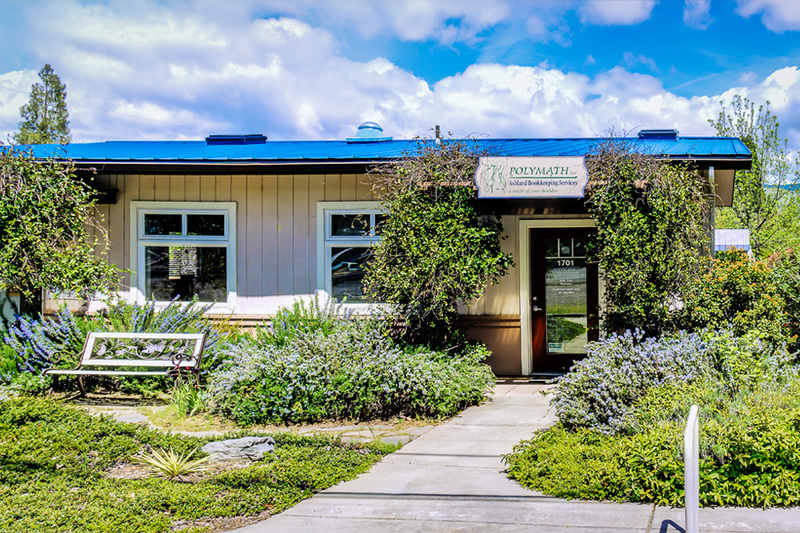 Polymath LLC is a bookkeeping company located in Oregon’s beautiful southern Rogue Valley. Surrounded by rolling hills, panoramic vistas of the Siskiyou mountains, and the world-class Oregon Shakespeare Festival, Polymath embraces everything wonderful about the area. It is a company full of life and fun, but they take their work with clients very seriously. They are fully dedicated to their client advisory services and have embraced cloud technology, software solutions, and business methods that support flexible relationships with their clients. 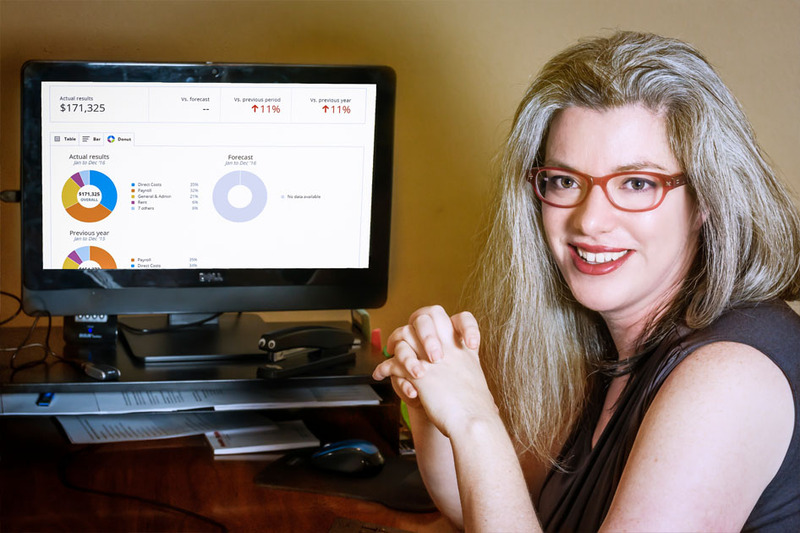 Polymath CEO and founder Ingrid Egstrom is a leader in the accounting community who regularly speaks on advances in the bookkeeping profession. She is also the founder of Ask a Bookkeeper, the engaging video series featuring Penny the Practical Professional. Polymath first began using LivePlan in 2015, after attending the LivePlan workshop at Scaling New Heights. That year, they began focusing on building their advisory services, and they were looking for a simple tool to support this. LivePlan’s cloud-based solution was appealing for its simplicity and structure, and lined up with their other products like Quickbooks Online. Polymath began offering LivePlan to select small business clients who wanted to create Lean Plans and do a better job managing their businesses. First and foremost, Polymath had difficulty having conversations with their clients about the broader concepts of business planning and management, which are necessary for a successful advising relationship. The clients wanted advising, but without a clear framework, their expectations about advising were sometimes unrealistic. Clients would often come in for monthly visits with their own specific issues to solve, and as a result Polymath was spending time on those issues in a reactive way, instead of using a proactive approach and solving foundational issues. Polymath needed a method and framework for their advising services, to keep the tasks moving forward and set realistic expectations for their clients. Next, Polymath needed to expand their expertise in the area of client advisory services. It wouldn’t be enough to simply offer the LivePlan software; Polymath employees needed some training to feel confident deploying advisory techniques and strategies that would benefit their clients. For instance, in the first meeting Polymath had with LivePlan, they asked for help creating scripts that could be used in client meetings and for working with clients in an advisory role. Every industry has best practices that, once harnessed, make the job easier and the outcome better. Advisory services are no different. Lastly, Polymath was having trouble monetizing advisory services for themselves, and in showcasing the value of those services to their clients. They offered three tiers of bookkeeping packages, with advisory services starting in the middle package, knowing that LivePlan would provide a useful foundation for all business planning. The setup made sense, but the sales process was not effective. Polymath understood the value of LivePlan, but their method for onboarding clients was to emphasize the power of the cloud and encourage their clients to be independent users, entering their Lean Planning information themselves. They assumed that if their clients were passionate about their business, they would use LivePlan without Polymath’s help or direction. Polymath was certainly maximizing the value of the cloud, but clients were having trouble getting started on their own. LivePlan is an easy tool to use, but when a small business client has a relationship with an accountant, they generally want guidance. Without the advisory guidance, Polymath’s clients were not convinced that the advisory package was helpful. It was a bit of a “chicken-and-egg” issue. The clients needed help getting started, but because they weren’t actively using LivePlan on their own, Polymath was having trouble getting traction on their second tier advisory package. The implementation training for the LivePlan Method for Strategic Advising was exactly what Polymath needed. It gave them a simple framework to be able to kick off an advising relationship with their clients, get the clients engaged, and then have a roadmap for regular, cyclical advising—one that is worth a substantial amount more in monthly fixed price billing. It was clear that Polymath understood how beneficial LivePlan could be for their practice; what they needed was a structured way to do the work. 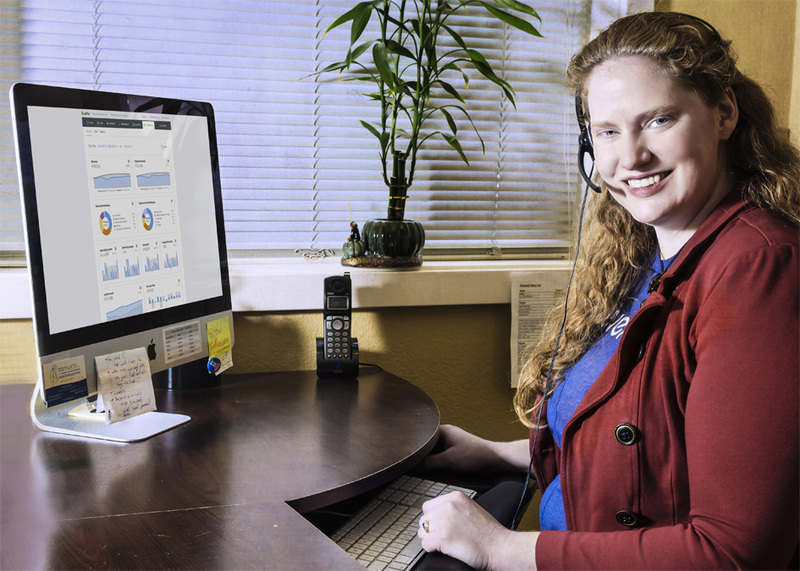 The LivePlan Method is a way to offer standardized advising services. Standardized procedures help because they streamline work and make it easy to build into existing into workflows and checklists. Tasks can be assigned to different team members, and are replicable for each client. Because advising services can be so open-ended, it’s especially beneficial for a firm like Polymath to have a standard method to follow. 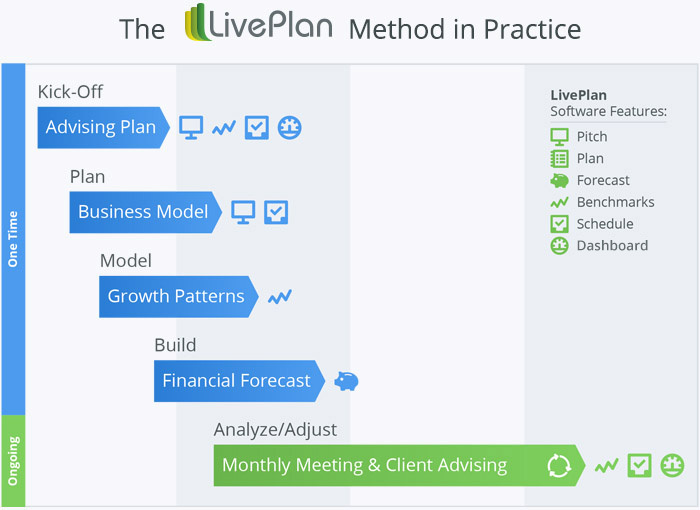 In addition, the LivePlan Method offers meeting agendas and scripting, to help the advisor in structuring their planning sessions with clients. For Polymath, the LivePlan Method provided the structure to inform and set client expectations, as well as guide the Polymath staff in areas of advising where they needed to develop their expertise. Lastly, because it is set up as a regular, cyclical method, the LivePlan Method supports fixed price monthly billing that makes sense for both the client and the firm. We taught Polymath the LivePlan Method for Strategic Advising, and helped them customize it for their company. The end result was a workflow that fit seamlessly into the rest of their processes. Teach the LivePlan Method for Strategic Advising, including how to divide the work into phases, and make sure that the company understands the purpose of each piece of the Method. Train stakeholders on the LivePlan software platform. Set up the first client in LivePlan, and use this client instance as a way to determine how best to customize the LivePlan Method process for Polymath’s own use case. The target client is a real client who is ready for advising services. Review the client instance and discuss Polymath’s version of the tasks. 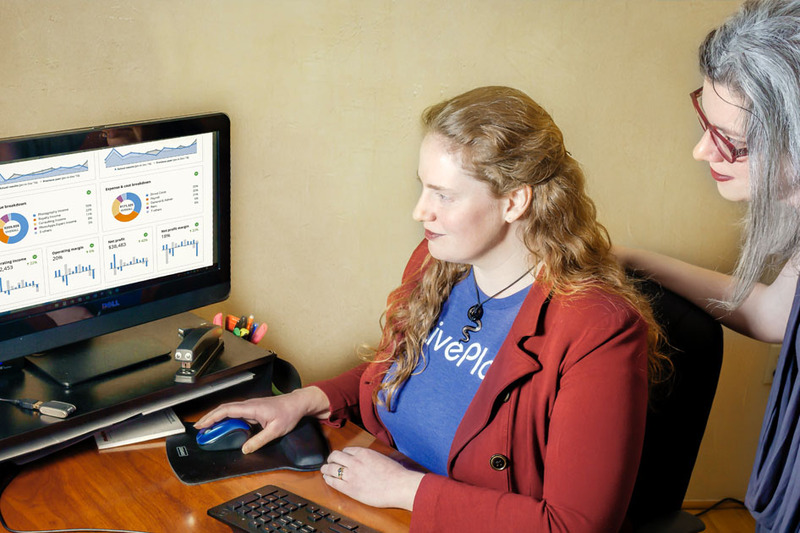 Import the Polymath version of the LivePlan Method into their workflow software, Asana. In Polymath’s final video meeting with the LivePlan Method team, Ingrid and Vanessa demonstrated how they had incorporated LivePlan Method tasks into their Asana workflows, and how easily the tasks had integrated with work they were currently doing. Some tasks were added to their discovery steps, some added to their recurring monthly work in-house, and some added to their monthly meeting. The entire LivePlan Method had been integrated into their regular workflow, and they confirmed that the work was efficient and integrated nicely. The LivePlan Method provided Polymath not only with the tasks they needed to complete a checklist of work, but meeting agendas and talking scripts to help get them through advising conversations that can seem difficult to an accountant or bookkeeper who is not used to having these strategic discussions. Polymath is taking the lead in the advising relationship by spending just a little time upfront helping their clients ramp up their business planning processes. Now, Polymath feels they can introduce all their clients to their second tier of value pricing. Easily moving clients from tier one to tier two pricing is a huge growth opportunity for Polymath. The LivePlan Method, in conjunction with the LivePlan software, allowed the entire Polymath team to gain confidence in their advising skills. The tasks and scripting gave Polymath, as well as their clients, a framework to know what to do (or to expect) next. This knowledge keeps the entire relationship proactive instead of reactive, which helps to keep the advisor in the driver’s seat. Ingrid and Vanessa of the Polymath team are a great example of how varying needs can all be met with the LivePlan Method. Ingrid is a big picture person. She likes strategizing and having conversations about long-term goals and vision. The LivePlan Method gave her a framework to take those conversations further, making them tactical. In our case study, Ingrid chose a client she had been working with for quite a while, but was never able to get started on real advising. After LivePlan method training, she was able to focus this client on his business goals, and turn those goals into categories for strategic financial forecasting, which empowered the client with the resource he needed to better understand his own business. On the bookkeeping side, Ingrid was even able to clean up his chart of accounts once she saw how everything was being tracked. On the other hand, Vanessa is a very tactical person. She enjoys the nitty gritty of bookkeeping transactions and analyzing data. The LivePlan Method tasks and scripting gave her the tools she needed to have goal setting conversations with her clients about their businesses futures. With the LivePlan software and the LivePlan Method training, Polymath is now able to add profit to their business model through streamlined advising services. With every client they sign on for Strategic Advising, they grow their revenue, but also their profit margin. They know upfront exactly how much time they will spend with each client every month because of the structure, process, and tools behind the LivePlan Method. It also allows Polymath to tailor their advising services to fit their business exactly. Not only that, because the LivePlan software fits precisely into the Method and is cloud-based, they can take advantage of tremendous workflow efficiencies. Lastly, the LivePlan Method’s cyclical nature is designed to help firms switch to (or support existing) billing at a monthly fixed price. Advising training on best practices: The LivePlan Method for Strategic Advising adds the advisory best practice layer that brings the true value of LivePlan software. Advising meeting agendas and scripting help you engage with clients and make the most out of a work session, while LivePlan itself aids in developing smart financial forecasts. Planning as the foundation: True advisory services are built on a foundation of planning, not reporting. Business planning is what defines goals and drives the forecast. Reporting is the last layer—and is crucial—but it is not the foundation. Strategic planning and goal setting are key and they are the true heart of LivePlan. 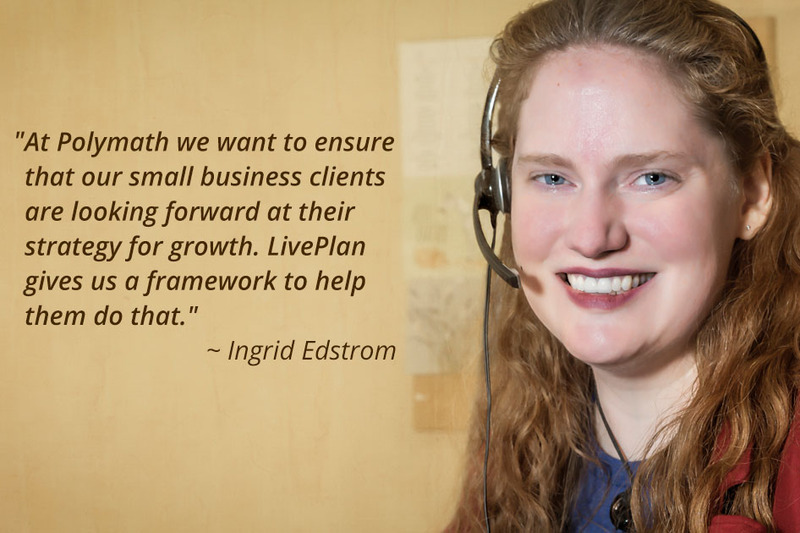 Built for the small business owner: LivePlan is something your clients will always understand because it is built with the small business owner in mind, not as an accounting tool. As clients progress over time, they will develop a better understanding of how to shape their own forecasts. Since LivePlan is cloud-based, the advisor will benefit from their client’s increasing independence. Scalable: The LivePlan Method can be inserted into any firm as a repeatable business process that is both profitable and strategic. Professional deliverables: LivePlan frees firms from countless spreadsheets for financial modeling and offers very sophisticated output in the form of web pages, slide deck presentations, and graphical KPIs—the entire platform for strategic advisory services. Cloud-based and secure: LivePlan is accessible from anywhere—no installation onto various machines, and no dealing with downloads or upgrades. Ready to use the LivePlan Method in your Strategic Advising practice?